Artice was born in Virginia in 1770, the son of William Cook and Mary Jamima Flake. 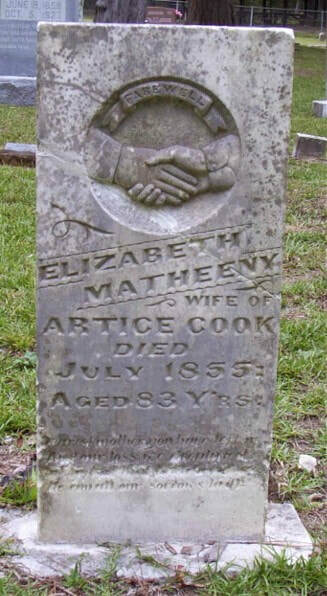 He married Mary Elizabeth Matheeny in Abbeville, South Carolina in November 1839. Mary was born in 1772 and died in July, 1855 and is buried in Dabbs Cemetery, Frankston, Anderson County, Texas. Artice died in 1840 in Laurens, South Carolina. The 1810 Census records show three people in the household living in Laurens, South Carolina. One male age 26-44; one female under age 10; one female age 26-44. The 1820 Census records show the Artis Cook family living in Laurens, South Carolina, with a total of 6 people in the family. Two males under the age of 10; one male age 26-44; two females under age 10; two females under age of 10; one female age 26-44. One male engaged in agriculture. The 1830 Census records show Artur Cook [Artis Cook; Artis Samuell Cook; Atus Cook] living in Laurens, South Carolina with a total of 8 free, white persons living in the household – 2 males age 5-9; 1 male age 10-14; 1 male age 15-19; 1 male age 50-59; 1 female age 10-14; 1 female 15-19; 1 female age 40-49; with 6 persons under the age of 20. The 1840 Census records show only Elizabeth Cook living in Laurens, South Carolina with one male age 15-19; one male age 20-29; one female age 20-29; one female age 59-59; one person engaged in agriculture; three people over the age of 20 who cannot read or write; for a total of four people in the household. The 1850 Census records show only Elizabeth Cook, age 70 living in District 2, Tuscaloosa, Alabama with Sarah Cook, age 30. Pension records for Samuel Cook show that Samuel and Elizabeth married in November 1839. Samuel enlisted for service in the War of 1812 on August 26, 1814 and was discharged January 30, 1815.